Computed tomography (CT)-guided biopsy of the thorax is a common procedure in the radiology department. Tissue diagnosis is vital in the investigation and treatment of a tumor mass. Common complications of CT-guided lung or mediastinal biopsy includes pneumothorax, small hematoma, or self-limiting hemoptysis  but infrequently fatal. 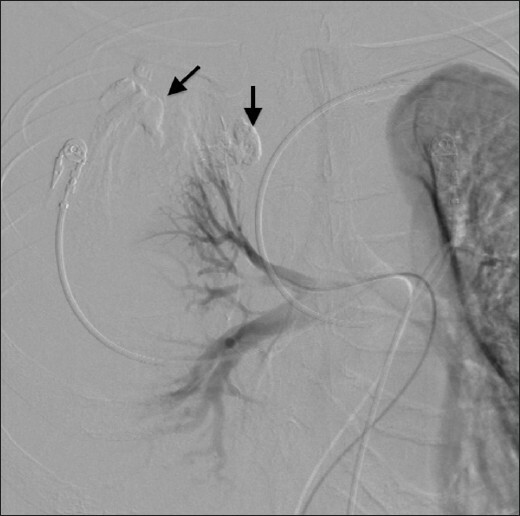 The case illustrates a rare complication in a common procedure resolved by transarterial embolization procedure aided by a pre-angiographic CT study. A 35-year-old man presented initially with progressive weight loss and anemia. CT showed mediastinal lymphadenopathy complicated with superior vena cava (SVC) compression and diffuse liver infiltration. Small bibasal pleural effusion, pericardial effusion, and venous collaterals were also present secondary to the vena cava compression. He has medical history of asthma, chronic gastric ulcers, and cervical spondylosis. The working diagnosis was lymphoma with secondary organ infiltration, thus requiring a confirmatory tissue biopsy. He was unable to tolerate bronchoscopy under sedation, as he was not fit for general anesthesia. He was then referred to the radiology department for percutaneous CT-guided biopsy of the mediastinal mass. There were two masses that were amenable for biopsy; the mass that paralleled the arch of aorta and the mass behind the compressed SVC. We chose the latter using a posterior approach. There were two attempts using a semiautomated 18-G biopsy needle yielding a good core from the biopsy. Post biopsy, the patient was asymptomatic. Three hours post biopsy, the patient became tachypneic with deteriorating vital signs and an urgent CT was carried out. A multi-phase CT with arterial, portovenous, and delayed phases was done and showed contrast extravasation at the posterior segment of the right upper lobe and a large right hemothorax [Figure 1]. Patient was pushed to the angiography suite to perform an immediate catheter angiography and intervention. Initial angiography showed no contrast extravasation arising from the subclavian and its branches or the intercostal arteries from the right second to fifth intercostal arteries. With the negative findings, the femoral vein was cannulated to check the pulmonary arteries. A right pulmonary arteriography showed contrast extravasation from the terminal part of the apical branches of the right superior pulmonary artery [Figure 2]. A selective cannulation was done with a 4Fr Cobra catheter. The 4Fr catheter was used instead of a microcatheter because we were able to selectively cannulate the specific arterial bleeder. A total of 3 ml of 1:1 NBCA (n-Butyl cyanoacrylate) and lipiodol mixture was injected. Glue was injected into the bleeder track that communicated with the pleural cavity and at the arterial bleeder point to ensure a good seal. The bleeding stopped immediately post-embolization, evident by post-angiographic run [Figure 3]. The patient had a chest tube put to drain the hemothorax and survived the complication. A repeat CT angio (CTA) study a week later revealed no active bleeding and affected only a small region of the right upper lobe lung parenchyma. Image-guided percutaneous biopsy is a commonly requested procedure for tissue diagnosis of mediastinal masses. , It is a quick and well-tolerated procedure and does not commonly require general anesthesia. Core needle biopsy is the preferred choice compared with fine needle aspiration biopsy, as histopathology is more reliable to characterize the tumor, particularly lymphoma. For the radiologist, the central location of the mediastinal mass exposes the risk of pneumothorax, hemothorax, and pulmonary hemorrhage. It is known for lung or mediastinal biopsies to have a small and localized hemorrhage with or without hemoptysis. These are usually temporary and are remedied by normal fluid resuscitation and observation. Despite careful maneuver of the biopsy needle and monitoring of the patient post biopsy, the patient developed a large hemothorax. The delay in symptoms was most likely due to the low-pressure pulmonary arterial system that ranges between 5 and 15 mm Hg. The CTA protocol prior to angiographic intervention has been a routine practice in the department for suspected hemorrhage and the multiphase study includes plain, arterial, and delayed phases. The location and the degree of the hemorrhage can be determined rather easily prior to therapeutic endovascular intervention. This will lessen the time spent on the angiographic table and secure the hemostasis faster. Based on the CT findings, right subclavian artery and its branches, relevant intercostal arteries, and right superior pulmonary artery territories were the main focus. Transcatheter embolization is a well-known procedure for pulmonary artery embolization. , There are many documented cases of pulmonary artery embolization, particularly when dealing with arteriovenous malformations in hereditary hemorrhagic telangiectasia  and pseudoaneurysms. Coils or particles are chosen frequently as the embolic material. In this case, the arterial bleeder originated from the terminal part of the apical branch of the right superior pulmonary artery. Distal or terminal arterial bleeders are suitable for transcatheter embolization using NBCA. NBCA or glue is known for endovascular management of arteriovenous malformations in the brain and spine. It is also known as the emerging embolic material of choice in gastrointestinal bleeds  and can be used in bronchial artery embolization. The rapid polymerization of the NBCA giving faster occlusion of the bleeder point makes a rebleeding event less likely. Another advantage of endovascular embolization is the ability to distally occlude the bleeder reducing the area of pulmonary infarct. Coils embolization is not chosen in this case, as the operator was able to achieve a distal cannulation. Coils embolization would have been the choice only if distal cannulation was not successful. The disadvantages of coil embolization are the time it takes to cease the bleed and should there be a rebleeding event, selective cannulation to the bleeding point may be technically difficult. In the case of intractable bleeding or failed endovascular embolization, a thoracotomy and surgical ligation has to be done. In our experience, selective distal cannulation of the bleeder point with the right concentration of lipiodol-NBCA mixture and good injection control, cessation of a bleeder site can be achieved confidently. 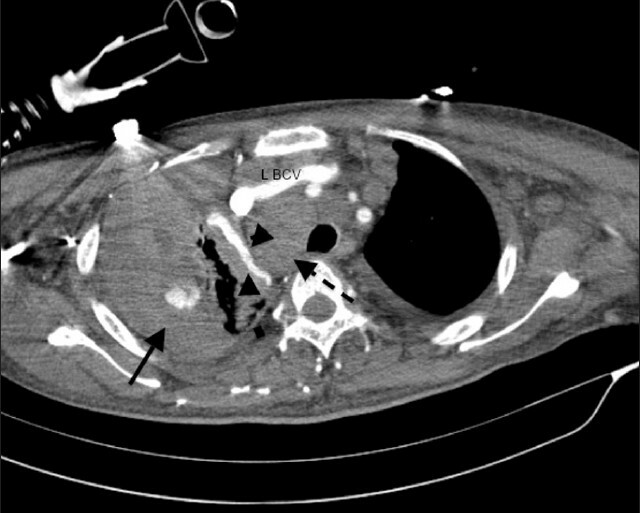 This case also illustrates that CT-guided mediastinal biopsy can occasionally presents a life-threatening complication and a good interventional radiology unit can help avoid mortality. Life-threatening pulmonary hemorrhage is a rare complication from a CT-guided mediastinal biopsy. Multiphase CT can help determine the possible bleeding points, reducing the time in the angiography suite. The severity of the complication can also be assessed. Transcatheter embolization of the active arterial bleeder done by the interventional radiology unit can be a life-saving procedure. 1. Venuta F, Rendina EA, Pescarmona EO, De Giacomo T, Flaishman I, Guarino E, et al. Ambulatory mediastinal biopsy for hematologic malignancies. Eur J Cardiothorac Sur 1997;11:218-21. 2. Balestreri L, Morassut S, Bernardi D, Tavio M, Talamini R, Gloghini A, et al. Efficacy of ct-guided percutaneous needle biopsy in the diagnosis of malignant lymphoma at first presentation. Clin Imaging 2005;29:123-7. 3. Priola A, Priola S, Cataldi A, Ferrero B, Garofalo G, Errico L, et al. Ct-Guided percutaneous transthoracic biopsy in the diagnosis of mediastinal masses: Evaluation of 73 procedures. Radiol Med 2008;113:3-15. 4. Zinzani PL, Corneli G, Cancellieri A, Magagnoli M, Lacava N, Gherlinzoni F, et al. Core needle biopsy is effective in the initial diagnosis of mediastinal lymphoma. Haematologica 1999;84:600-3. 5. Ralib AR, Zakaria R, Mohamad Z, Muda AS. Superselective embolisation in acute lower gastrointestinal haemorrhage: A single institution experience. Malaysian J Med Sci 2009;16:34-41. 6. Abreu AR, Campos MA, Krieger BP. Pulmonary artery rupture induced by a pulmonary artery catheter: A case report and review of the literature. J Intensive Care Med 2004;19:291-6. 7. Remy J, Lemaitre L, Lafitte JJ, Vilain MO, Saint Michel J, Steenhouwer F. Massive hemoptysis of pulmonary arterial origin: Diagnosis and treatment. Am J Roentgenol 1984;143:963-9. 8. Trerotola SO, Pyeritz RE. PAVM embolization: An update. AJR Am J Roentgenol 2010;195:837-45. 9. Block M, Lefkowitz T, Ravenel J, Leon S, Hannegan C. Endovascular coil embolization for acute management of traumatic pulmonary artery pseudoaneurysm. J Thorac Cardiovasc Surg 2004;128:784-5. 10. Lee CW, Liu KL, Wang HP, Chen SJ, Tsang YM, Liu HM. Transcatheter arterial embolization of acute upper gastrointestinal tract bleeding with n-butyl-2-cyanoacrylate. J Vasc Interv Radiol 2007;18:209-16. 11. 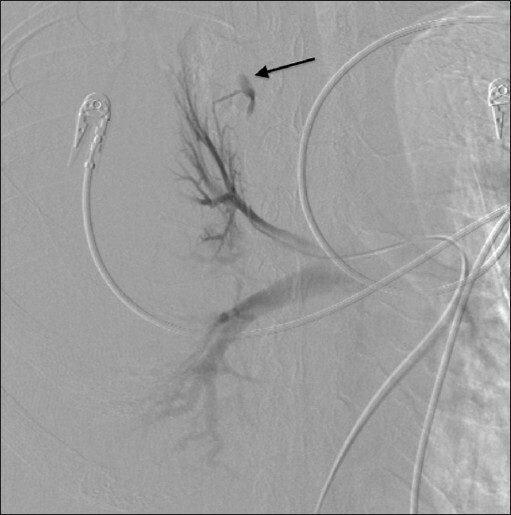 Razavi MK, Murphy K. Embolization of bronchial arteries with n-butyl cyanoacrylate for management of massive hemoptysis: A technical review. Tech Vasc Interv Radiol 2007;10:276-82.